Japanese Prime Minister Shinzo Abe has initiated a progressive plan since 2013 to boost the employment and the empowerment of women. 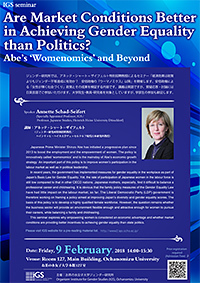 The policy is innovatively called ‘womenomics’ and is the mainstay of Abe’s economic growth strategy. Evidently, the recommendations of various international economic organisations have had a significant impact on shaping Abe’s new gender policy. The World Economic Forum, the International Monetary Fund, the Organisation for Economic Co-operation and Development (OECD) and the Goldman Sachs Investment Bank are urging Japan’s public and private business organisations to reform their corporate structures in order to adapt the economic sector to the requirements of an ageing society. An important part of this policy is to improve women’s participation in the labour market as well as in political leadership. In recent years, the government has implemented measures for gender equality in the workplace as part of Japan’s Basic Law for Gender Equality. Yet, the rate of participation of Japanese women in the labour force is still low compared to that in other OECD nations. Japanese mothers, especially, find it difficult to balance a professional career and childrearing. It is obvious that the family policy measures of the Gender Equality Law have had little impact on the labour market, so far. The Liberal Democratic Party (LDP) government is therefore working on framing a policy aimed at improving Japan’s diversity and gender equality scores. The basis of this policy is to develop a highly qualified female workforce. However, the question remains whether the business sector will provide an environment flexible enough and attractive enough for women to pursue their careers, while balancing a family and childrearing. This seminar explores why empowering women is considered an economic advantage and whether market conditions are providing better incentives to achieving gender equality than state politics. Aizawa, Nobuhiro (28 September 2016): Accommodating Japan’s youth and women in a silver democracy. In: East Asia Forum. Dalton, Emma (2 October 2016): Japan’s new icon for gender equality. In: East Asia Forum. Dalton, Emma (2017): Womenomics, ‘Equality’ and Abe’s Neo-liberal Strategy to Make Japanese Women Shine: In: Social Science Japan Journal 20 (1), pp. 95–105. East Asia Forum (3 October 2016): Women can save Japan. Koshi, Naomi (2 October 2016): Can embracing diversity solve Japan’s population problems? In: East Asia Forum. Mackie, Vera (1 August 2016): Closing the gender gap in Japan. In: East Asia Forum. Macnaughtan, Helen (28 January 2015): Abe’s Womenomics needs to include men too. In: East Asia Forum. Macnaughtan, Helen (27 August 2015): Is Abe’s Womenomics working? In: East Asia Forum. Morikawa, Masayuki (1 September 2016): Japanese companies need to get women on board. In: East Asia Forum. Nagase, Nobuko (29 September 2016): How to make Womenomics work. In: East Asia Forum. Yashiro, Naohiro (22 October 2014): Why ‘Womenomics’ is the way forward for Japan. In: East Asia Forum.